One of the more common questions we get at the SCO is “Where do I find ‘the’ school district map of Wisconsin?” The reality is the majority of the 400+school districts in the state don’t have a detailed, up-to-date map showing their exact boundaries in a digital format. They typically maintain the location of their school district boundaries using hard copy maps and/or some other format the district deems appropriate. 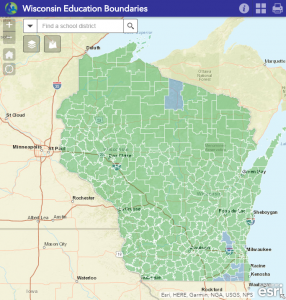 The Wisconsin Department of Public Instruction (DPI) maintains an excellent interactive mapping site that shows Wisconsin Technical College Regions, Cooperative Educational Service Agencies (CESA) boundaries, Unified School Districts, Secondary School Districts, and Elementary School Districts. DPI regularly collects boundary information for a variety of sources, and combines that data into one statewide view. The DPI site presents the best-available view of these district boundaries across the state. Parents or realtors seeking school district maps should contact the school district(s)—but call, don’t spend a lot of time browsing their site looking for a map because you probably won’t find one. When looking for parcel-level information, it’s always best to verify the information through county tax records available on county Web sites. For maps showing the extent of a school district, check the county land information Web site. Understand, of course, that school districts commonly cross county boundaries. If you are having trouble locating school district boundary maps in Wisconsin or need further help, please contact us via e-Mail or at (608) 262-3065.